When one takes a trip into the country one must have time to explore. That's exactly what we did this weekend and what a discovery we made. 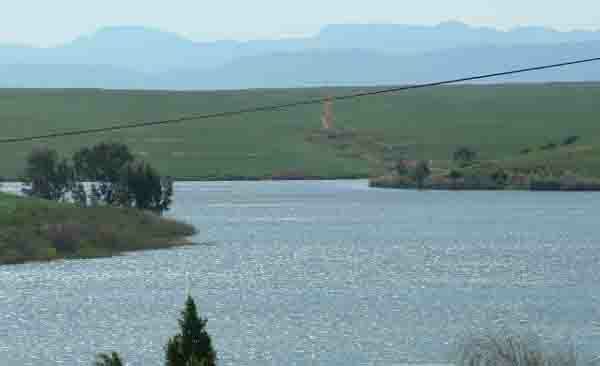 Driving along the N7 north of Moorreesburg we came across a sign which said “Misverstand Dam”. I'd heard the name a couple of times before but had never actually been there. We decided to go and see the Misverstand Dam for ourselves. The turnoff took us onto a gravel road, which we followed through the wheatfields, up hill and down dale for about 10 kilometres. The scenery was fantastic with the lovely green wheatfields spreading out as far as the eye could see. Here and there in the fields were flocks of sheep and cows all adding to the beauty of the area. In the distance we could see the peaks of the Cedarberg mountain ranges as they rose above the hills we were driving through. We finally arrived at a road sign which pointed the way down to the dam. There in front of us was the beautiful the Misverstand dam lying in the valley between hills of green wheatfields. I can just imagine what it is like coming upon an oases in a desert, but here we came upon an oases in the middle of a sea of green. If you were Afrikaans speaking you would know that “misverstand” means misunderstanding. The dam's name means misunderstanding and if you look at the dam wall you can see why. The two farmers who were funding the building of the dam wall had an argument and it was never completed. Had they been completed the water in the dam would most probably have been about 10 metres deeper which in turn might have destroyed some of the beautiful rock faces to be found higher up river. Misverstand Dam is a boaters paradise and if one started counting would most probably find about a 100 fancy speedboats being stored there. Regular visitors to the dam have built what they call extended caravan sites for accommodation. Caravans have been parked on a site and instead of a tent a wooden tent has been built around the caravan so that it looks like a house. There are a number of streets of these caravan houses and they have some weird names. One is called six pack avenue obviously because of the partying that takes place there. Club Elani also has a number of brick and mortar houses built along the edge of the dam. A good investment going by the prices they go for. The owners of the club have opened a shop,bar and a restaurant on the premises. On Sundays a special Boerekos meal (Farm food) consisting of (vleis, rys en aartappels) meat rice and potatoes and vegetables is prepared for those visitors who would like to enjoy a good home cooked farm meal. A visit to the club on a Sunday which includes an hour cruise on a pontoon up the river and the meal is only R80.00 per person. On our visit the owner was about to launch his big pontoon to take us on our cruise when one of the campers stepped in and offered us a trip up the river on his speedboat. We were whisked up river at about 30 knots and were soon 15 kilometres upstream from the dam wall. The scenery on both sides of the river was great and we also noticed a number of wild birds and wild flowers growing on the banks. There were a number of cliff faces along the banks, where plant life had established itself. 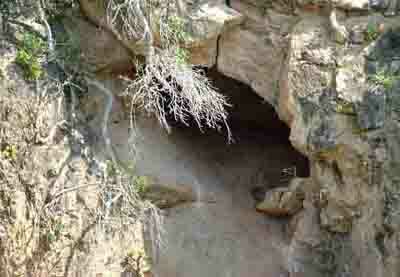 One cliff had a cave where bats lived. Finding this large river and dam in the middle of the wheatfields was such a surprise that we forgot to ask which river we were on. It turned out to be the Berg river which is famous for its annual canoe marathon. 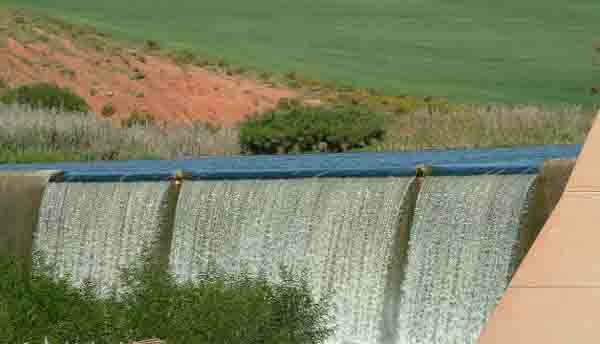 The dam is a water paradise where one can sail, ski and fish. It is full of fish which include bass, carp and barbels. In November there will be a fishing competition on the dam and when I enquired if there were any special fishing spots the owner just laughed and told me that some of the contestants were visiting the river regularly to feed the fish. What some people will do to win a competition. This oasis in the middle of the wheatfields is really worth a visit. For those who would like to stay over there are twelve chalets which can be hired for the weekend or longer. Club Elani appears to be extremely popular so book your place as soon as you can to avoid disappointment.